Regular visitors will have noticed that no new walks have been added since 18th October, sadly because of a family bereavement. 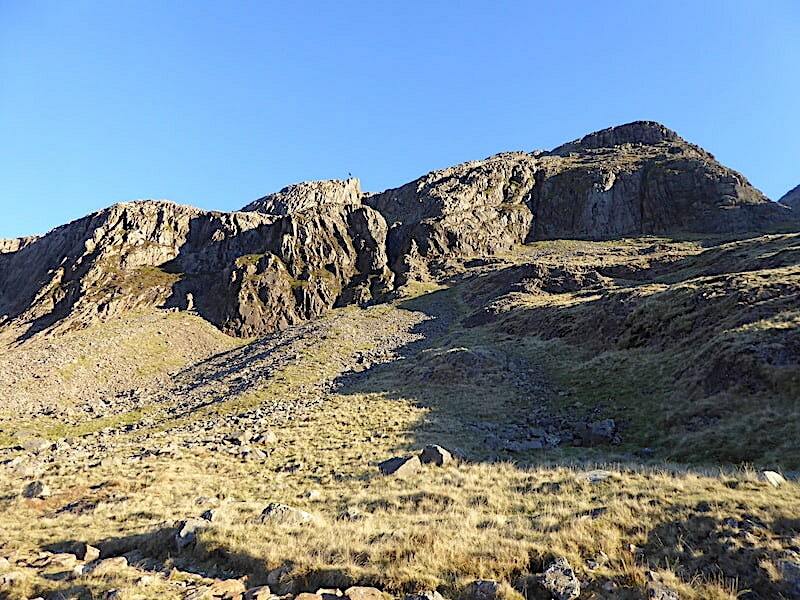 My sister died five days after our last walk and, as her only next of kin, I have been too occupied dealing with all that needed to be done to have any spare time to be out walking the fells. She also lived 130 miles away from me so a fair amount of travelling back and forth has been necessary too. The funeral took place a couple of days ago so now we are back at home and trying to get back into our normal routine after what has felt like living in a distant universe for the last month. 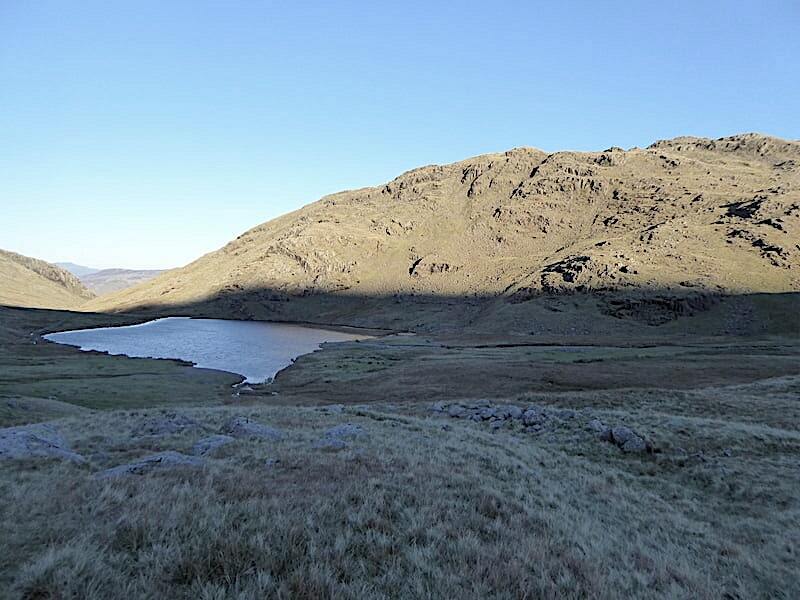 The weather forecast held the prospect of a cool but sunny day today so we decided to return to the Scafell Pike Corridor Route, which we walked in September, and pay a visit to Lambfoot Dub, a short detour we didn’t do during that walk. 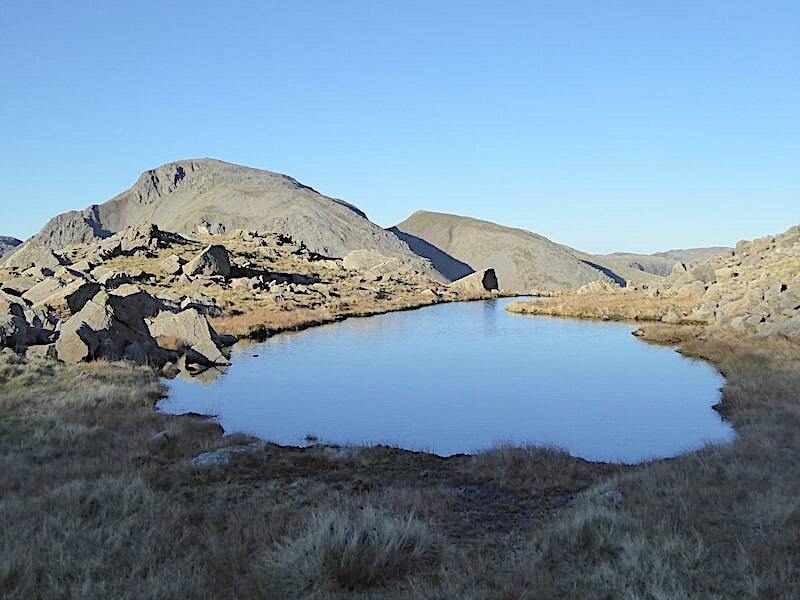 The tarn is usually deserted and would be a very peaceful place just to sit for a while and, hopefully, alleviate some of the stresses and strains of the past few weeks. 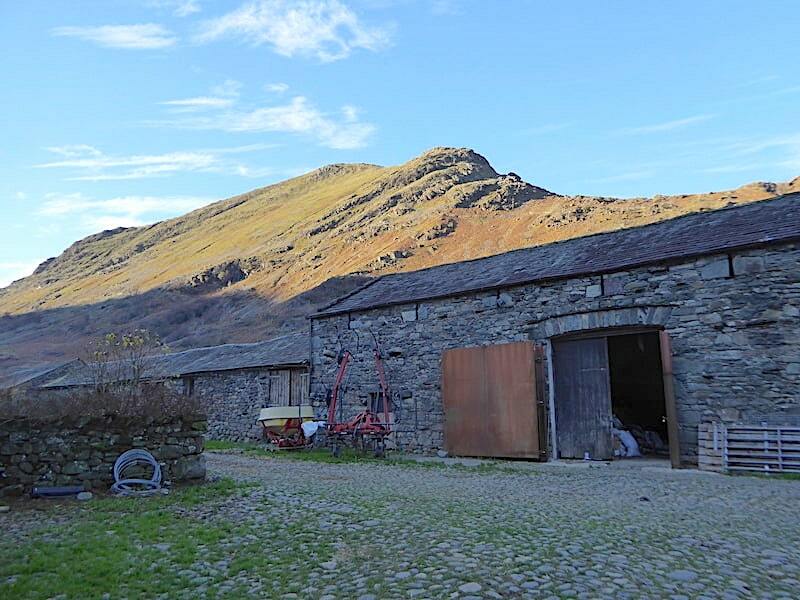 A lovely sunny day sees us starting out from the farm at Seathwaite where Base Brown is brilliantly illuminated behind the very heavily shaded farm buildings. The approach lane to the farm was as crowded as usual and we parked in the field as we did in September. It was only after putting our £3 ‘in’t box’ that we saw a notice on which the £3 had been crossed out and £5 written in its place. Ooops! We remained in the same chilly shade as we walked along the path beside the gill towards Stockley Bridge. 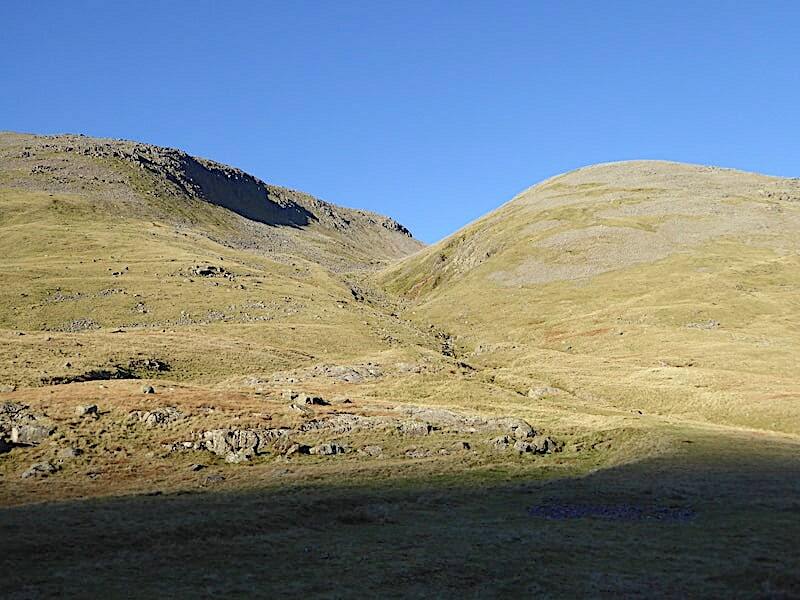 The sun is still lurking behind Thornythwaite Fell to our left and the fell’s shadow is keeping the temperature well down. Although our upper bodies were well wrapped up we were both wearing our summer weight trousers and the chill was cutting straight through them. Mental note made to dig out the thicker, lined ones and stow the lightweight ones away for the next few months. 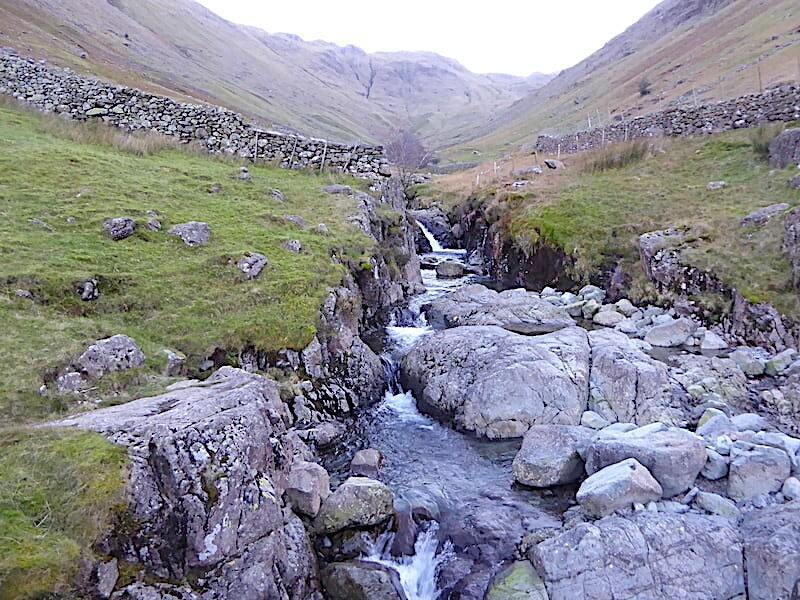 Directly ahead is Seathwaite Fell and over to the right you might just be able to pick out Taylorgill Force. Despite the lateness of our start, its now just on ten o’clock, there were still plenty of people walking up from the farm. Some headed up Grains Gill, others, ourselves included, followed the path beyond the wall in the shot making their way up to Sty Head. 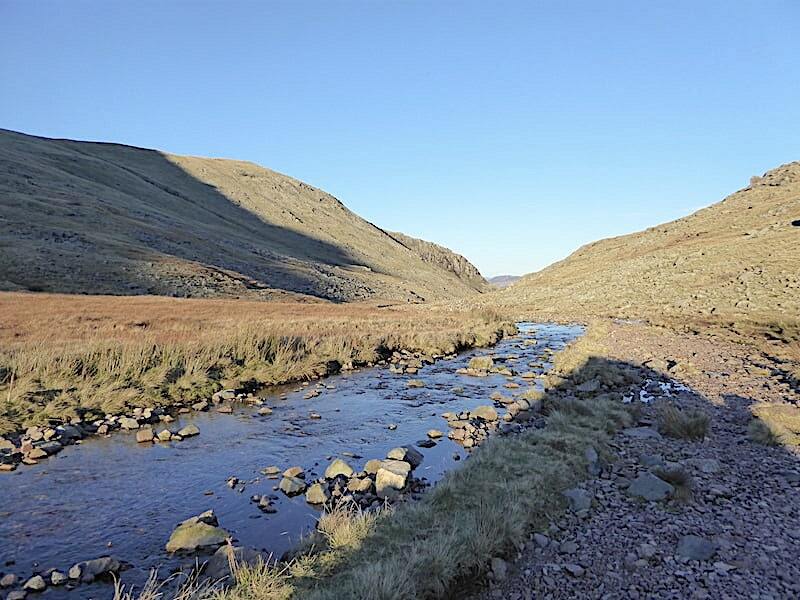 The crystal clear, and probably very chilly, water in the gill below Stockley Bridge, which two walkers had just crossed and were now making their way up the path to Greenhow Knott. A look back towards the farm as we make our way up. 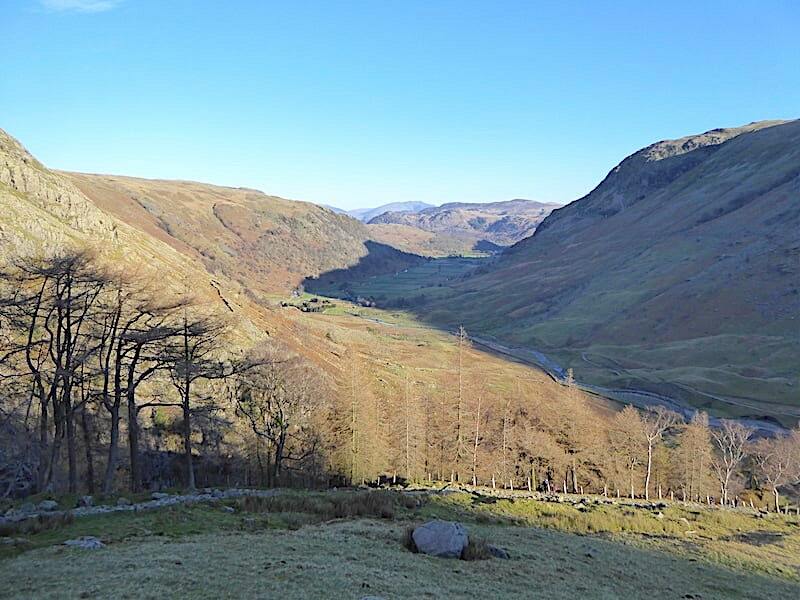 Thornythwaite Fell’s shadow is covering practically the entire valley floor and we’re looking forward to enjoying some sunny warmth as we approach Greenhow Knott. On Greenhow Knott I took a look back along the valley. 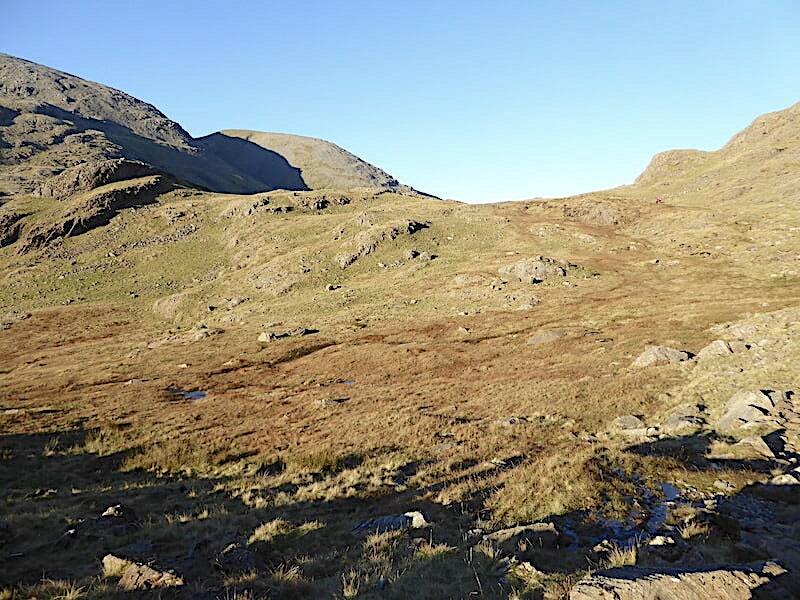 Its clear from the photo that we did enjoy a brief sunny interlude on the way up but, having reached the top, once again we are in deep and chilly shade, this time courtesy of Seathwaite Fell which was right behind me as I took the shot. From Greenhow Knott we continue along the path beside Styhead Gill which has some lovely falls and cascades along its length, although they are probably seen to best advantage from the path on the opposite side. We remained in the shadow of Seathwaite Fell for quite a long section of the walk up to the bridge where we were finally able to remove our jackets and enjoy some of the sunny weather. 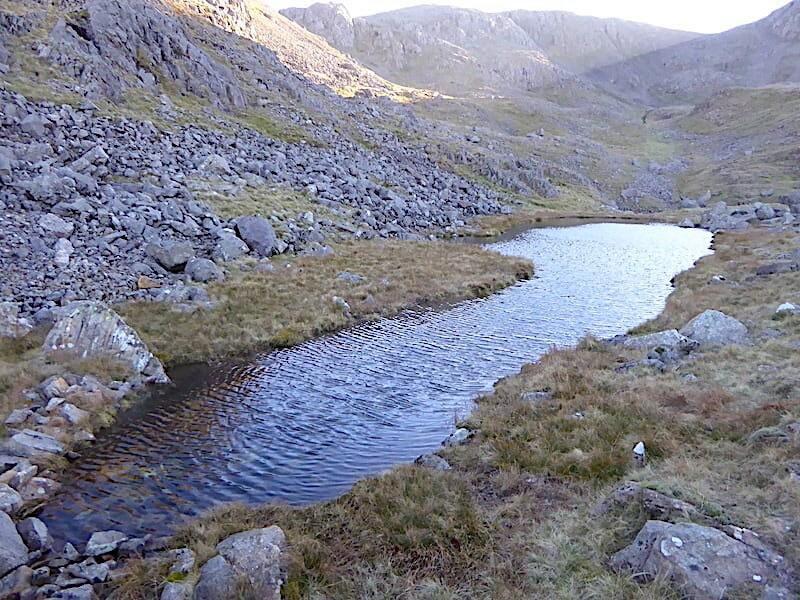 By the time we reached Styhead Tarn we were back in shadow again, this time that belonging to Great End. 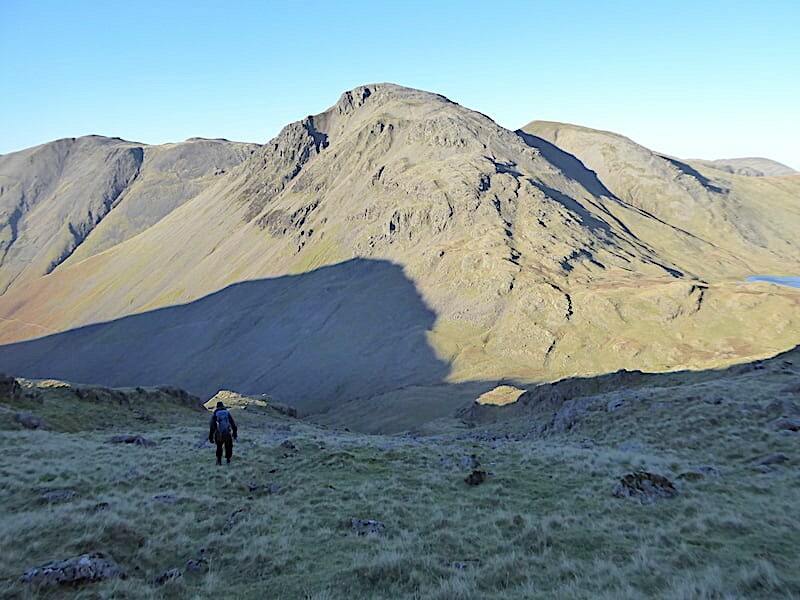 Couldn’t do much about the foreground shadow but at least Great Gable and Green Gable show up well in the sunny conditions. 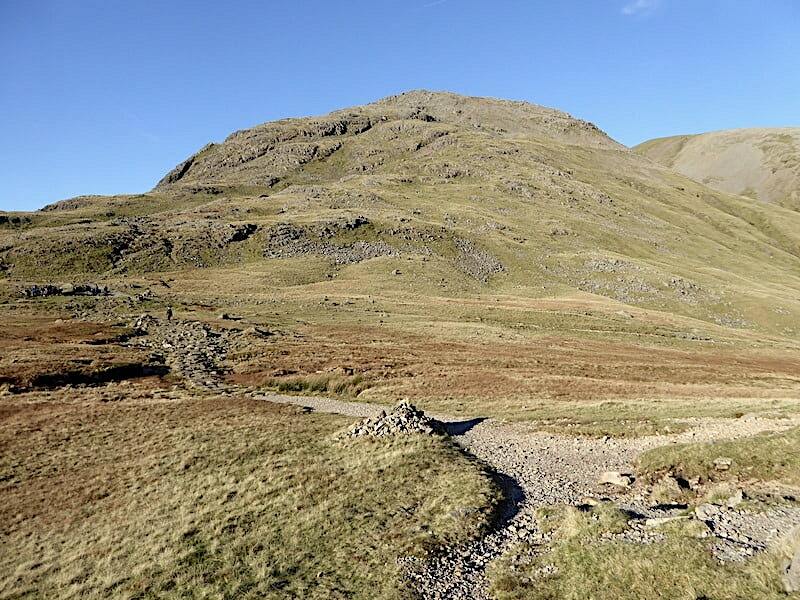 The route between the two is known as Aaron Slack, a path which is long, steep and rough for the most part. 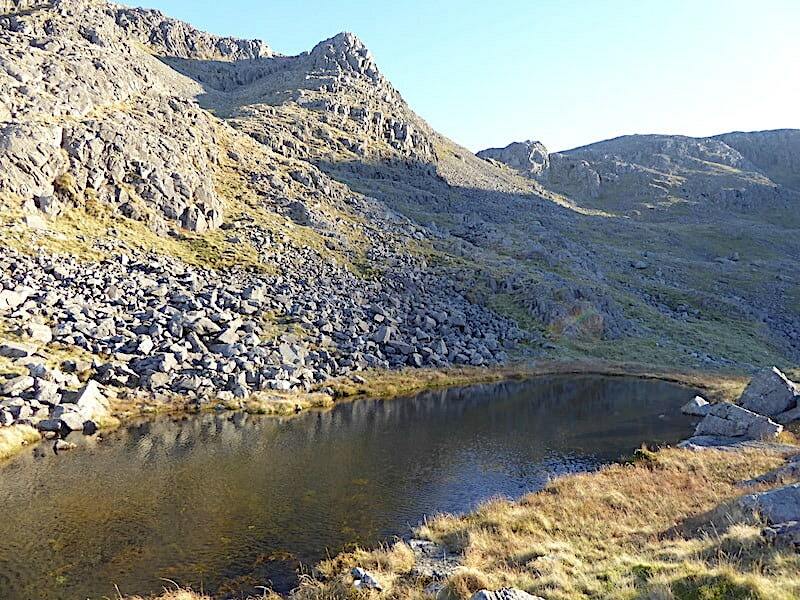 Styhead Tarn with Great End now keeping us in the shade. We began to feel the effects of the cool and gusty wind along here but we stuck it out without our jackets and hurried on across to the stretcher box on the sunnier side. 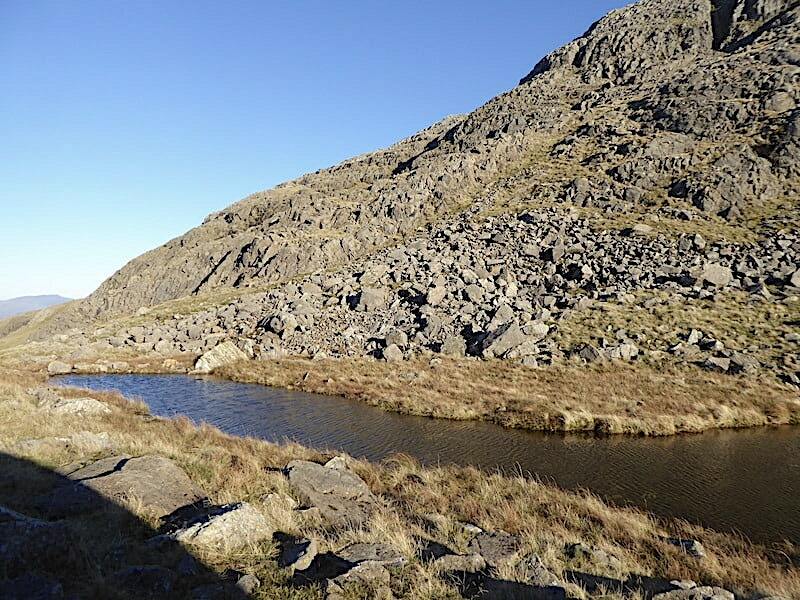 A look back at Styhead Tarn as we reach the warmth once again. 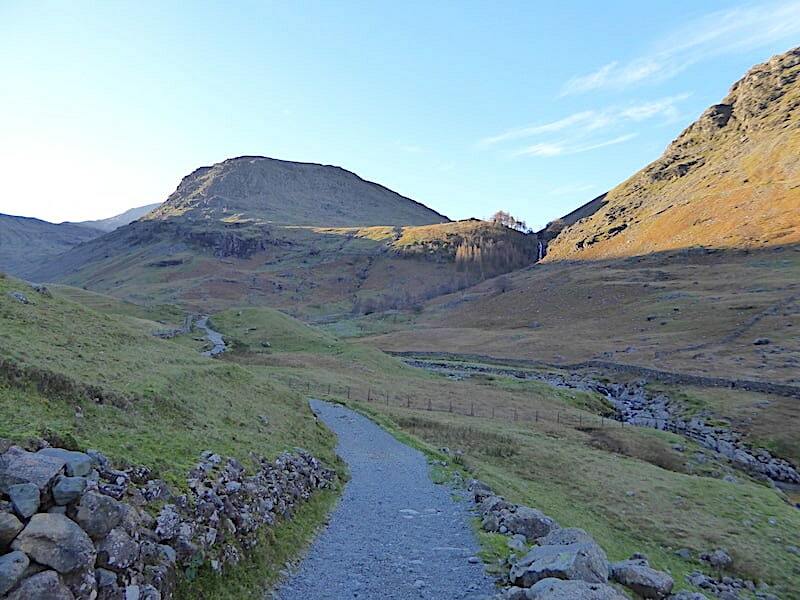 In the few minutes we’ve been walking across, the path on the left with the walkers on it, and from where I took the previous shot, is bathed in sunlight now that the shadow of Great End no longer falls across it. Planet earth doing what its always done and simply carrying on with its twenty four hour rotation schedule. Its nice to have the warmth even with the disadvantage of not being able to see a thing ahead of us. 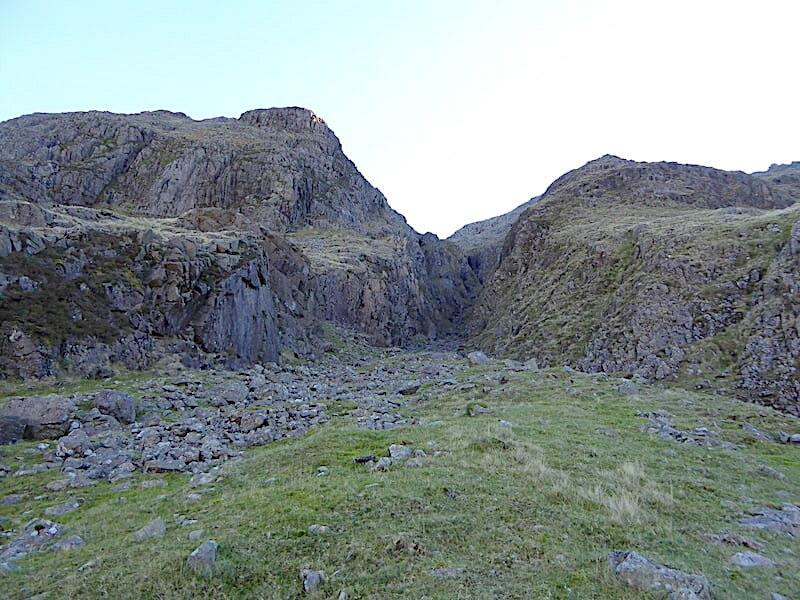 As you might be able to see there was quite a crowd at the stretcher box so we headed across over here, perched ourselves on a couple of rocks, put our jackets back on and took a coffee/Mars Bar break. Despite the sunny conditions the cool and gusty wind kept arriving from all directions so we didn’t stay any longer than necessary. The hot coffee was very welcome and suitably fortified we hoisted our packs and off we went again. 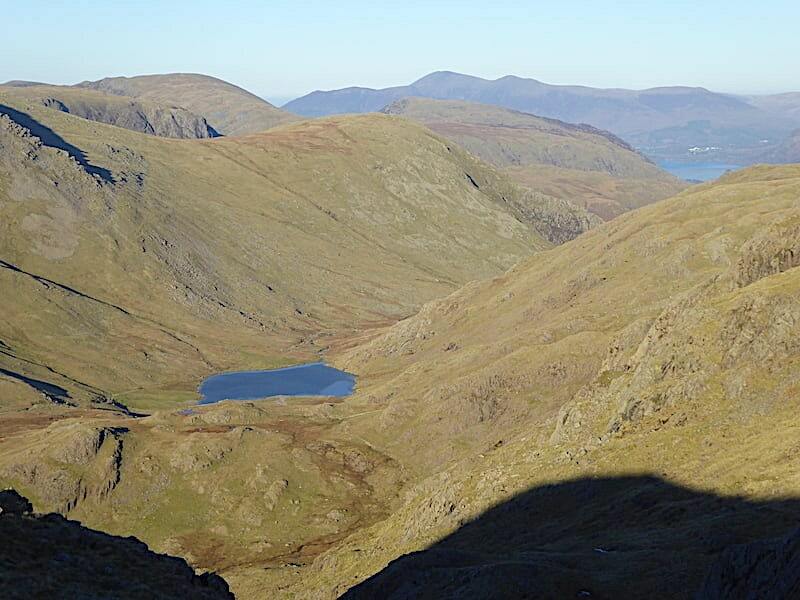 A sunny view of Green Gable, Base Brown and Styhead Tarn as we climb away from Sty Head and into the shadow of Great End once more. You can’t always walk on the sunny side of the street at this time of the year. Over the rise and we’re back in the sun but only for a few moments as we head for the path, branching off to the right, which will lead us to the Corridor Route. As the shot shows, the path descends below the cliffs and crags of Spout Head and further on below those of Great End so from now on we’ll be walking in their shadows. Brrr! 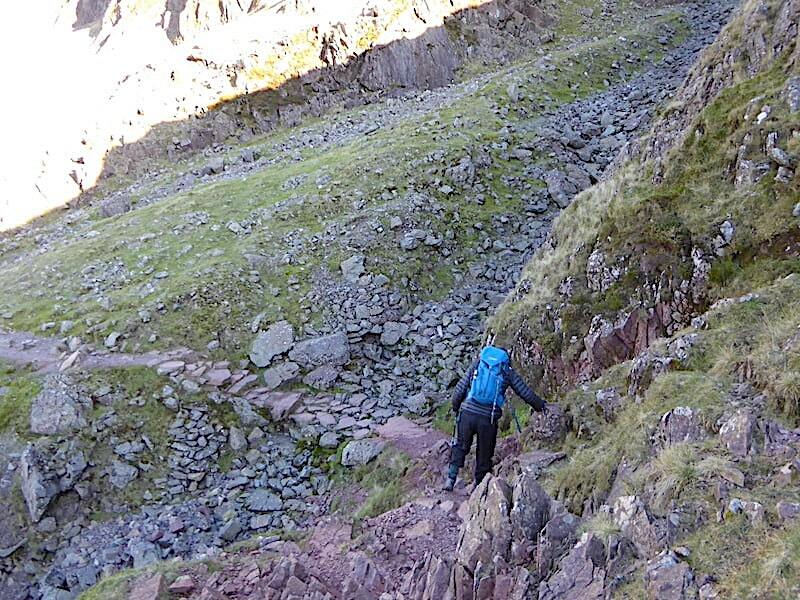 Descending into a very chilly scene with Skew Gill, over on the left, just ahead of us and Piers Gill over on the right. 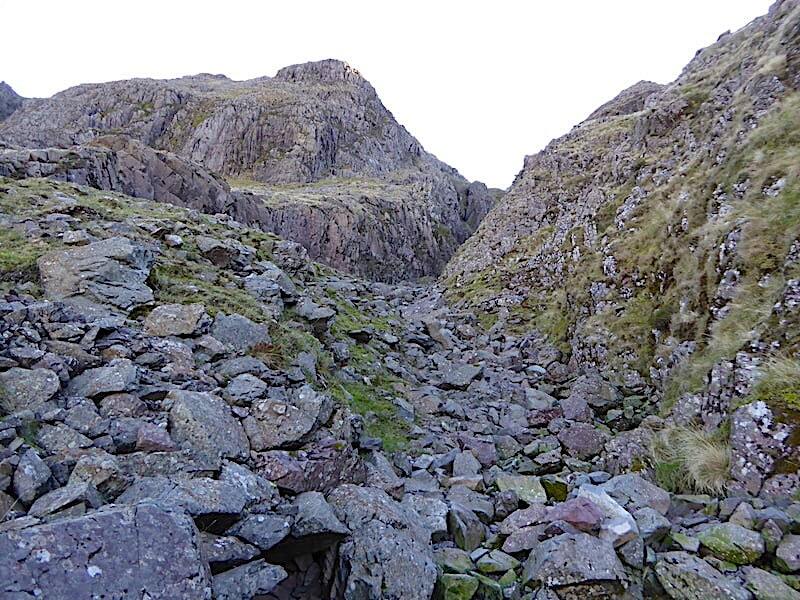 A closer look at the awesome sight of Piers Gill, with Lingmell looking even more forbidding in the very deep shade. 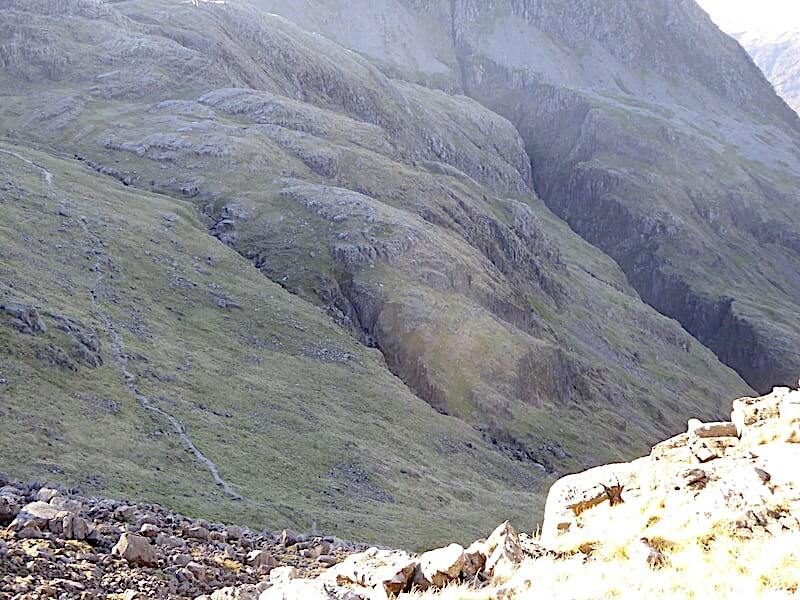 A look over my shoulder at the soaring crags of Spout Head as we approach Skew Gill. 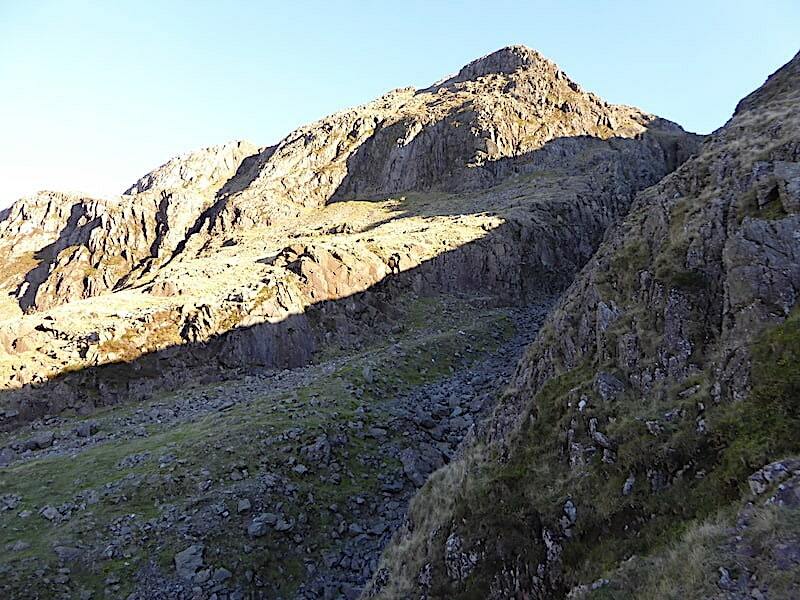 The view up Skew Gill as we pass below it. I’m now hanging around until a bunch of noisy young lads, a little way behind us at this point, catch up with us. Their loud, and incessant, chatter was irritating my already slightly frayed disposition and I did not want to hear any of it any longer. Just when you need a bit of peace and quiet …..! 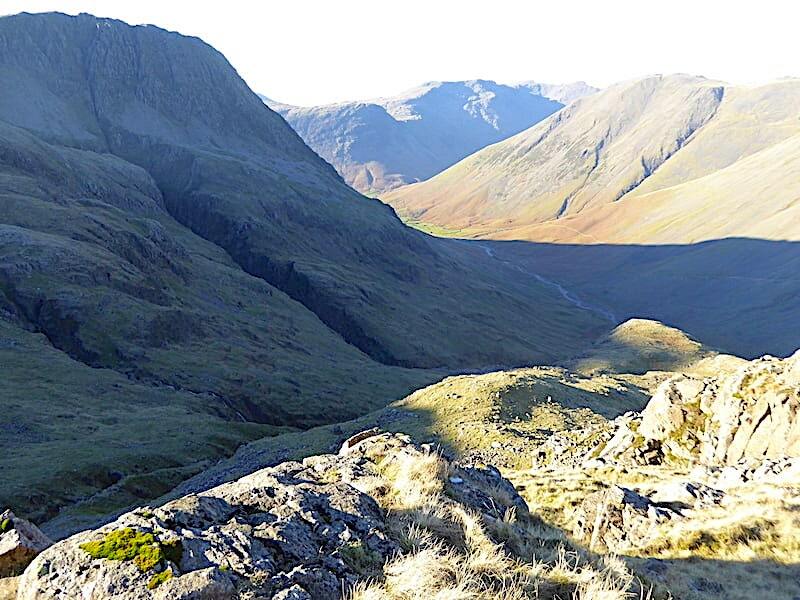 While waiting for them to pass by I took a look down towards Wasdale Head with Skew Gill just in the shot on the left. Very chilly looking along there too. A day of extreme contrasts. 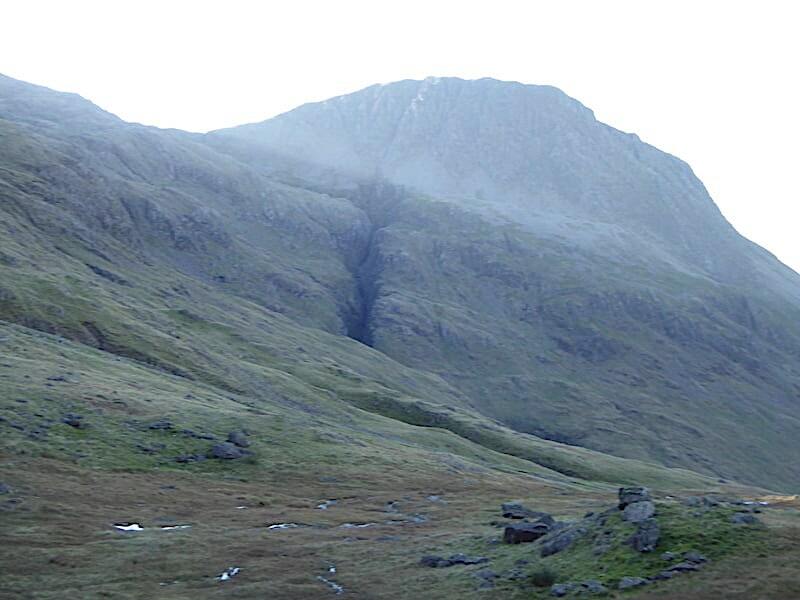 Another look up Skew Gill as the chatterbox bunch finally walks past us and their voices eventually fade away into the cool, damp air. 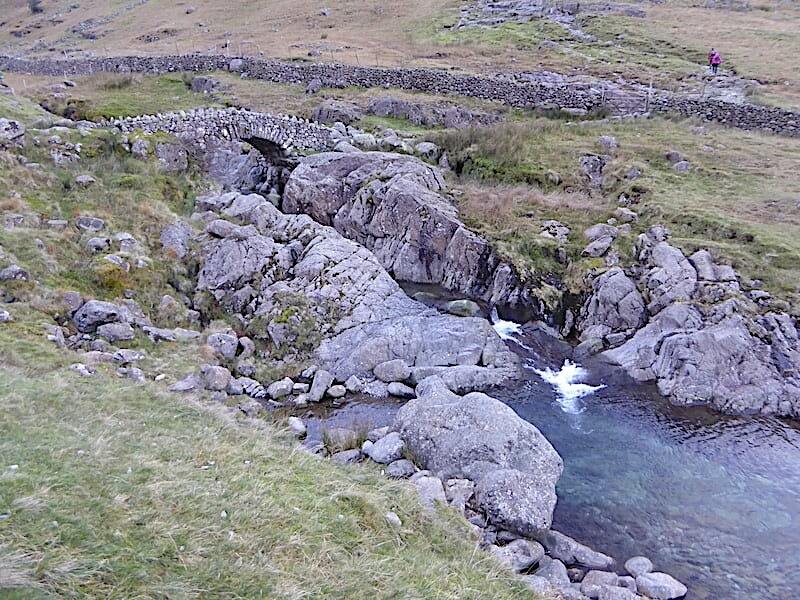 Once they had disappeared over the rise we take the mini scramble across and up out of the gill. J takes a moment to steady himself on the loose stones before stepping any further. None of it is difficult, you just have to make sure of your footing as its a bit loose in places. 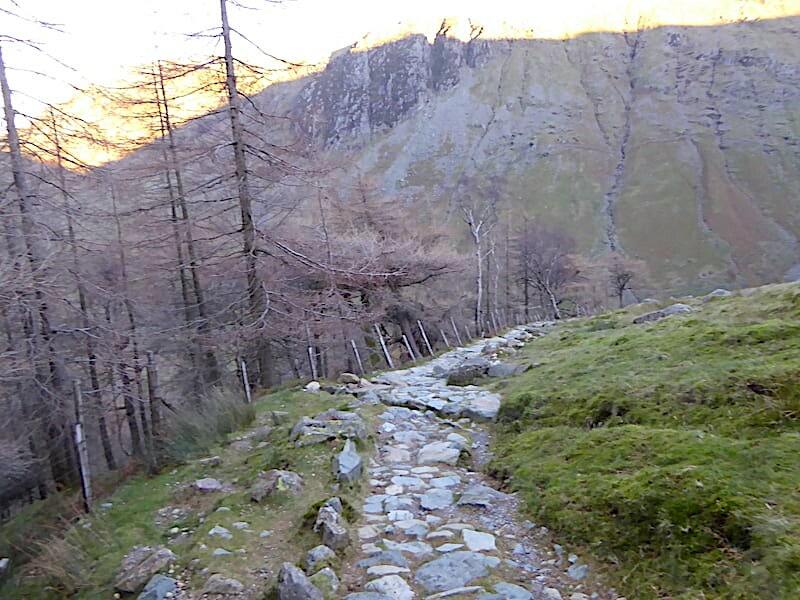 We continue on the path, well pitched with stone for most of the way as it rises steeply up the hillside. 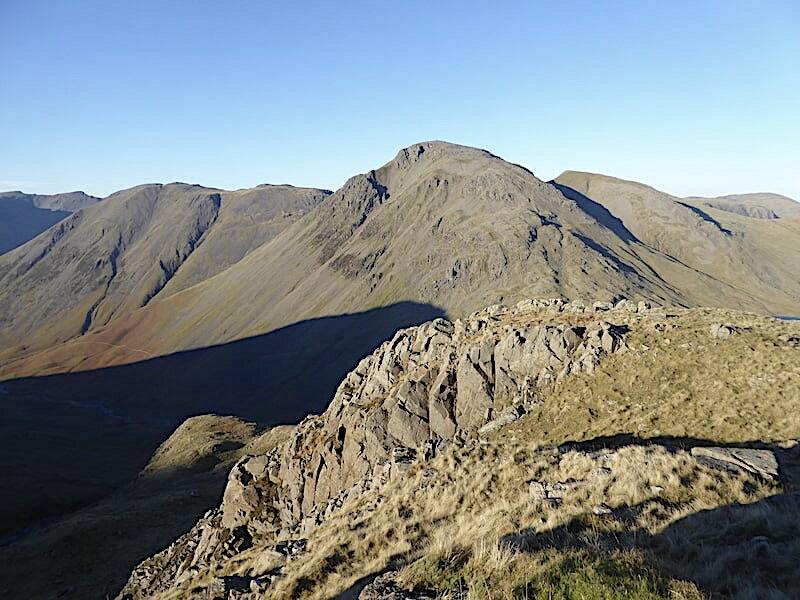 The views of Great Gable are tremendously impressive from the Corridor Route. A closer look at the various rock formations of the Great Napes and the steep and stomach churning scree runs of Great Hell Gate behind them. 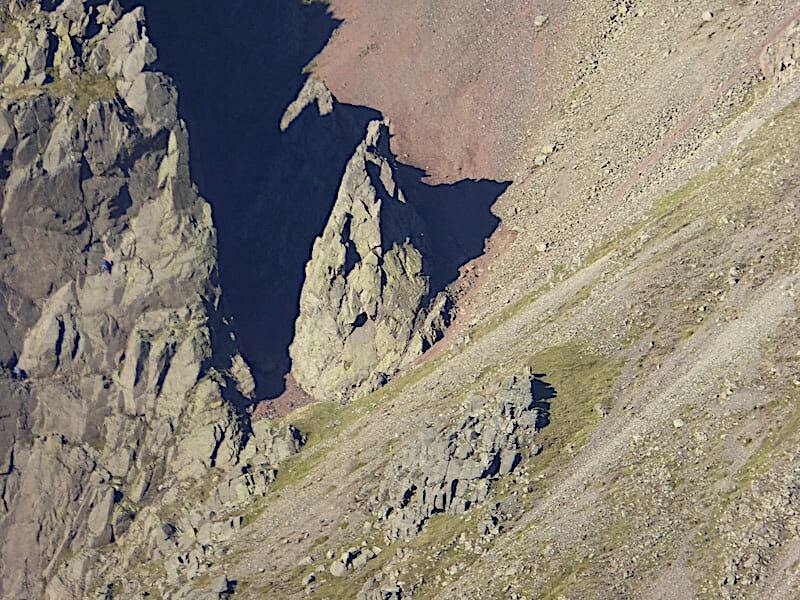 Through the zoom I could see some climbers so …..
….. I zoomed in a little more for this close up of one the more distinguishable rock forms, Hell Gate Pillar I think, to the left of which you may be able to pick out the climbers if you zoom in. One is a light blue speck on the extreme left of the shot and the other is a darker blue speck a little higher to the right. 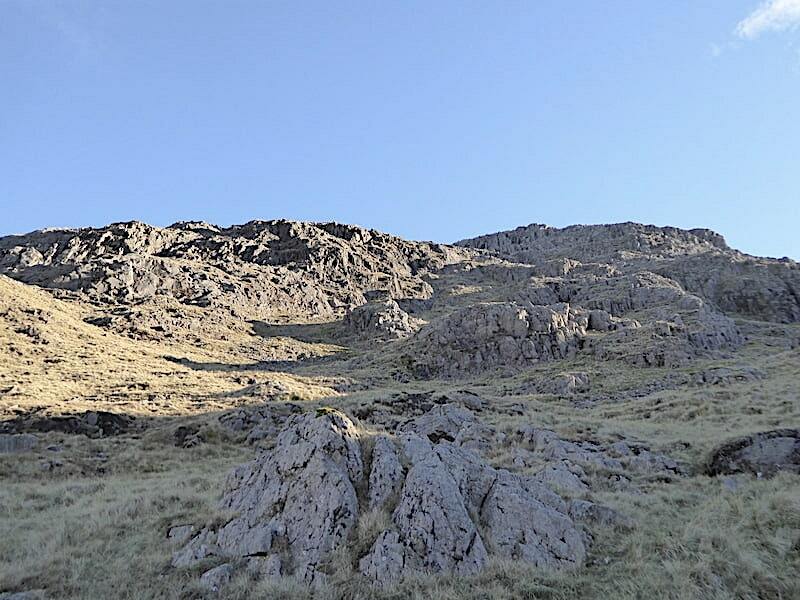 It looked as though they were heading for the finger of rock to the right of and just above the higher climber. 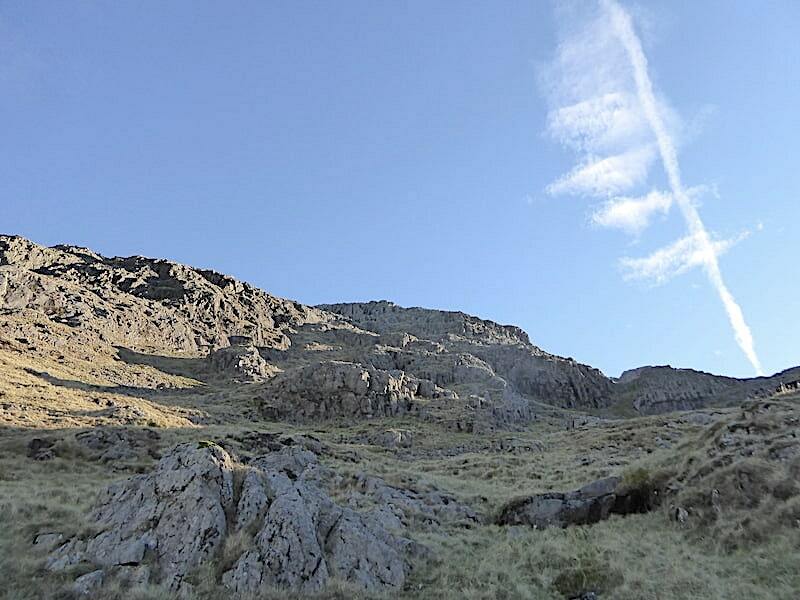 We left the Corridor Route and began the steep climb up to Lambfoot Dub where this unusual formation around a contrail caught my attention. It reminded me of a toothbrush well past its use by date. The view ahead without the whimsical ‘toothbrush’ effect. 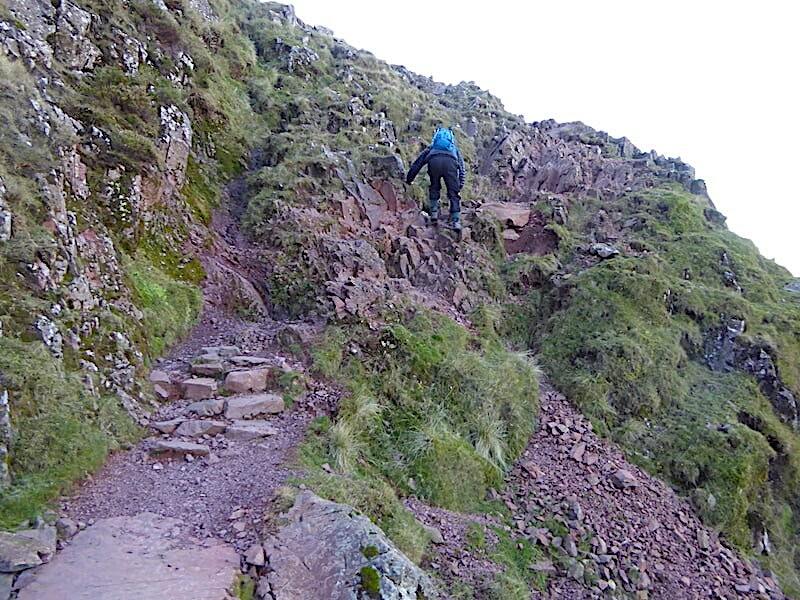 Its a steep climb and there is no established path so its an energy sapping climb over tussocky and spongy grass. 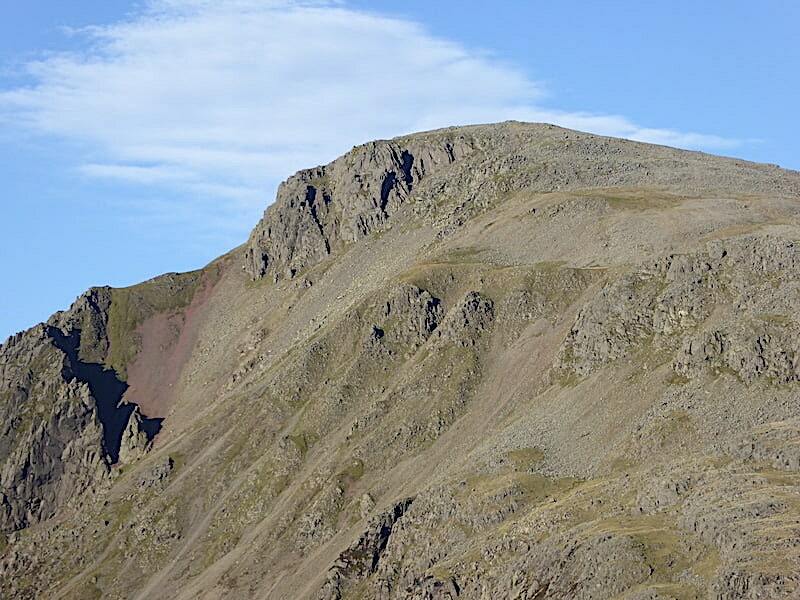 The top of Great End is over on the right skyline. Peace and quiet aplenty up here, apart from the two of us cursing and ouching now and then as something or other throws us a little off balance. 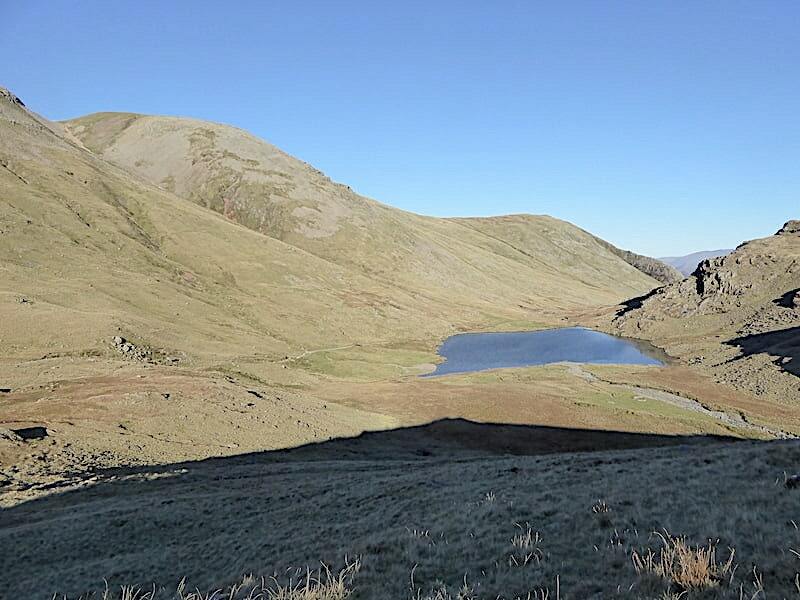 We make it up to the little shelf, where the tarn is situated, and its long distance view stretching from Great Gable along to Skiddaw and Blencathra on the right skyline. Right behind us is Lambfoot Dub with Round How behind it on the centre skyline. 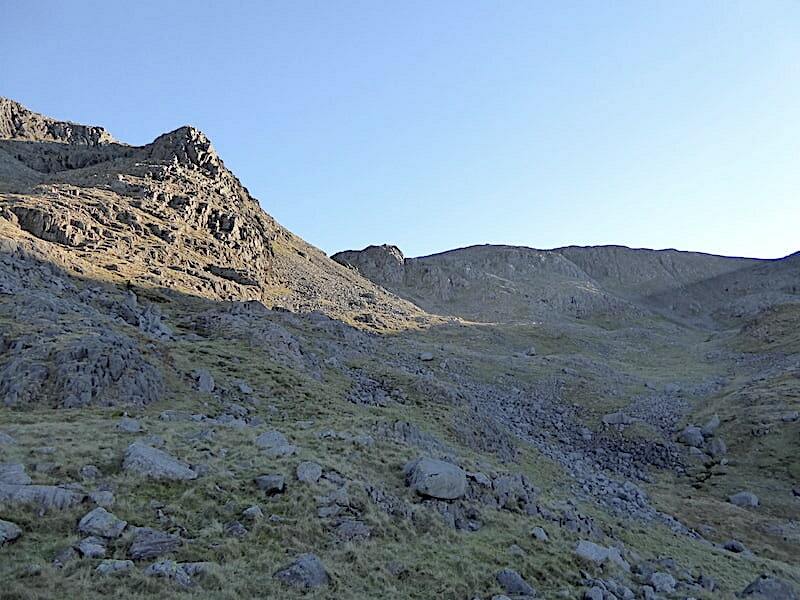 At the moment Scafell Pike, over to the left, is blocking the sunlight so the scene looks a little austere. 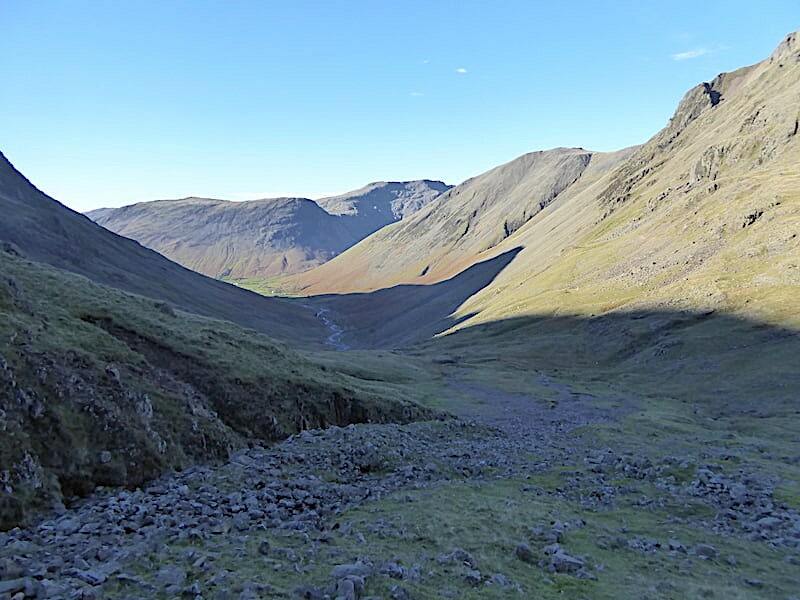 Also looking austere and quite intimidating is Lingmell and the great gash of Piers Gill, with Greta Gill to the left of it. In the bottom left quarter of the shot is the Corridor Route, now far below us, with a number of walkers making their way over it. 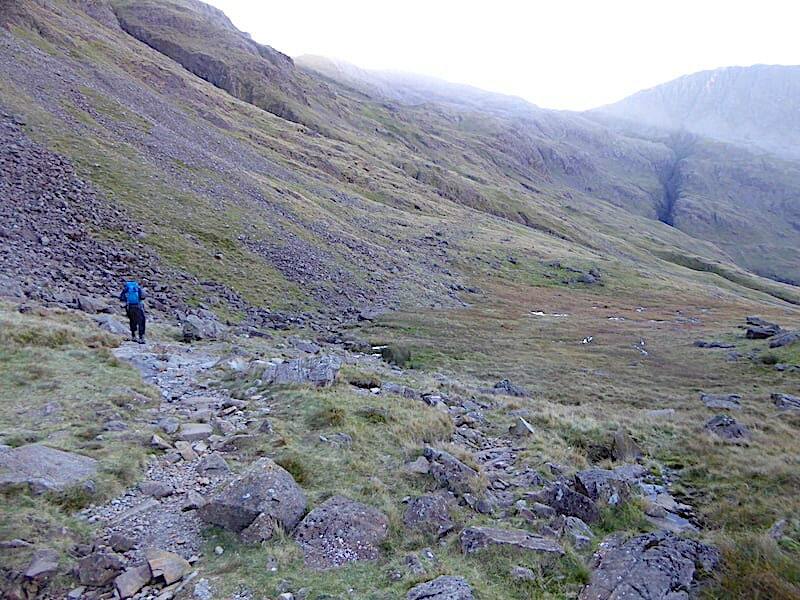 There’s still a fair way to go before Scafell Pike is reached. 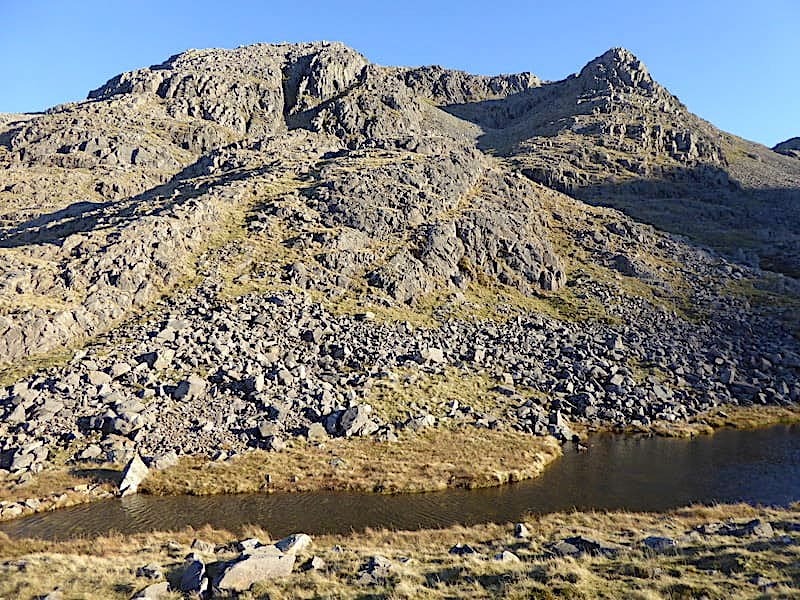 From the tarn looking up in the direction of Broad Crag and Ill Crag at a scene of rock and boulder strewn desolation above which the sunlit peak of Long Pike shines like a beacon. I wanted peace and quiet and here it is in abundance. The wind is still gusting around, even more so up here perhaps than it was back at Sty Head. Of course, we’re much higher up now and the nature of the landscape just around here means that there are many more gullies, chasms and ravines for the wind to swirl around in and through. We decided to take a food break up here. It was impossible to find anywhere sheltered given the unpredictable nature of the wind gusts so we plonked ourselves down on the least uncomfortable rocks we could find and tucked into our sandwiches and hot soup, and very welcome they were too because it was very much on the chilly side in this deep shade. Chilly or sunny, to be in this isolated spot and not have anything to do or worry about for a while was good first aid for the psyche. Lunch with a view, undisturbed by anyone walking by and the silence only broken by the whoosh of the sudden gusts of wind. Looks like it would be an interesting place to just roam around and explore and climb some of the humps and bumps just for the fun of it. 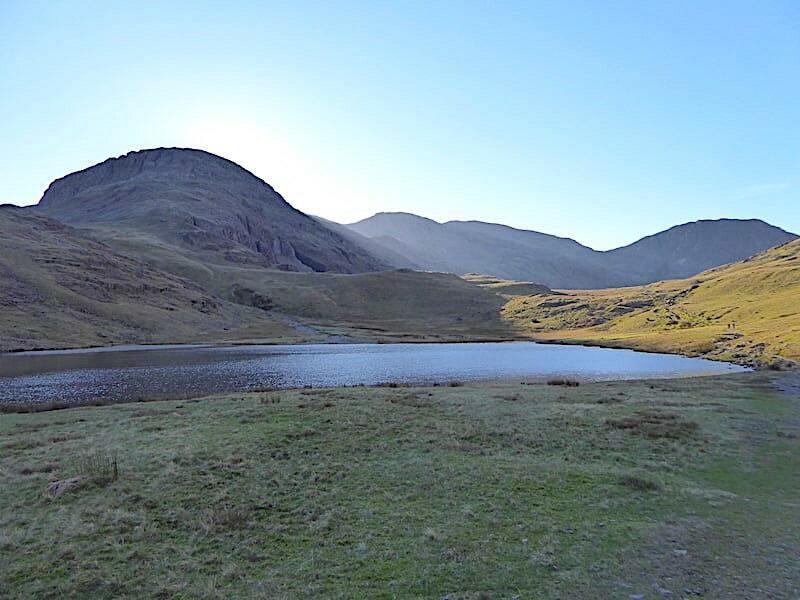 Lingmell and its deep gills again, still in deep shade and probably remaining so from now on as the sun will remain low in the sky until the arrival of longer daylight hours next year. The earth rotates a little more and the sunlight now falls on our little patch of hillside from where I take another look down at the Corridor Route, dotted with tiny figures as walkers make their way along it. Lambfoot Dub. Nothing for it but to stand in the shade to take a shot from this end of it. Even so the view is still very appealing and just for a few moments the gusty wind dropped and the surface of the tarn became as still as a millpond. 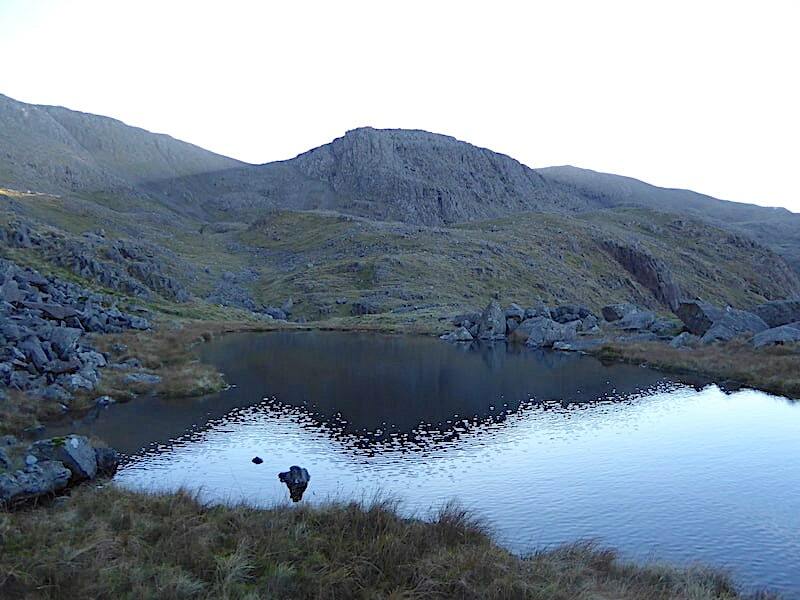 Another shot of the tarn with Long Pike above it. 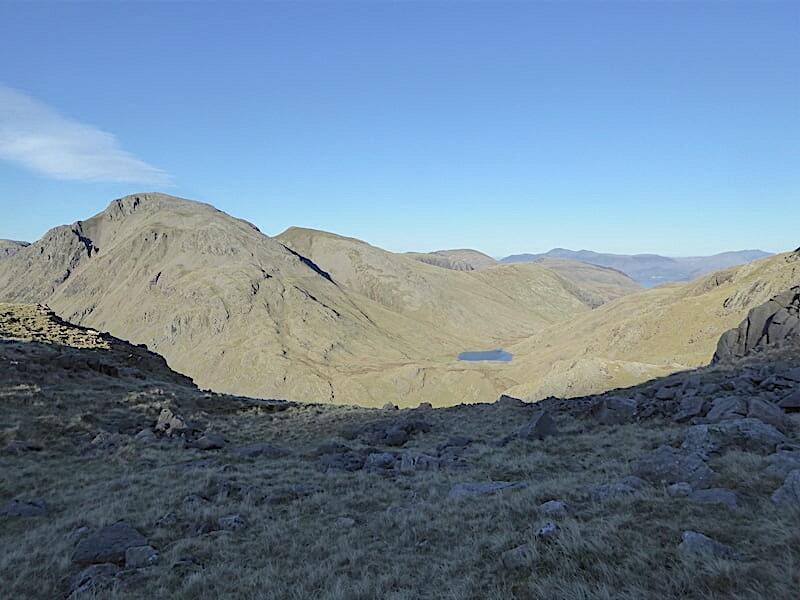 As you can see only the far end of the tarn remains in the shadow of Scafell Pike now so here a couple more sunny views of it …..
A little wander around after lunch to take in a couple more views. 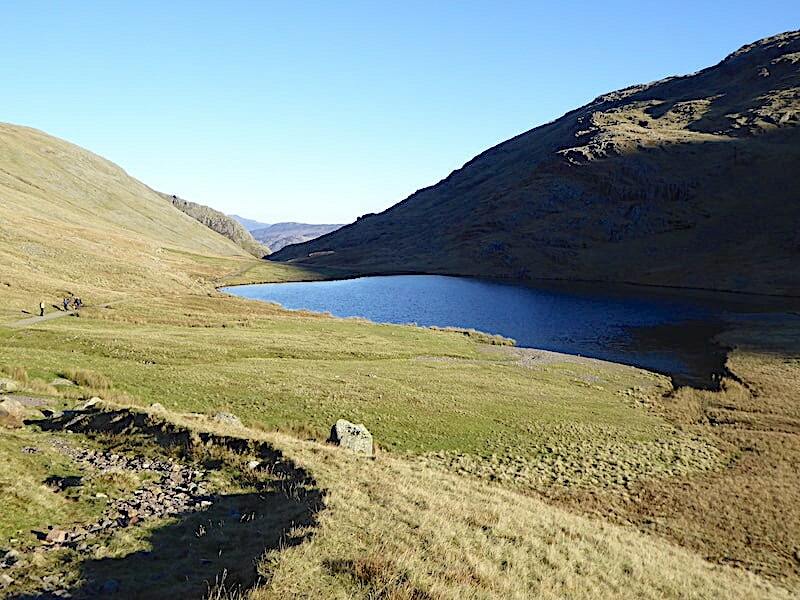 Here I’m looking down to Styhead Tarn below which you might be able to make out the path, branching off the main Esk Hause route, which took us below the crags of Spout Head and across to Skew Gill. 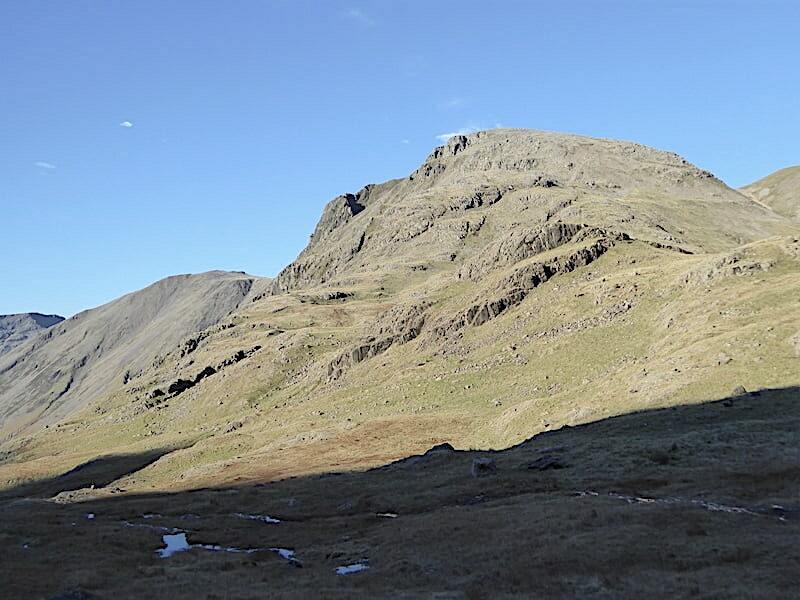 Kirk Fell, Great Gable and Green Gable across from us, while the sunny little peak just below us is Stand Crag. You might just be able to pick out the Corridor Route path in the shade below it. 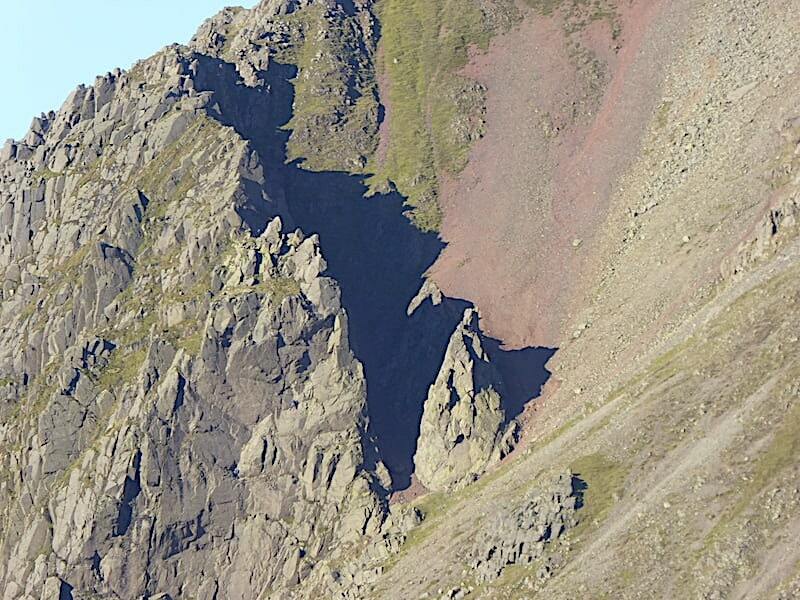 I forgot to zoom in to see how the climbers were getting on on Great Napes, duh! While we had our lunch break we talked about what return route we might take. 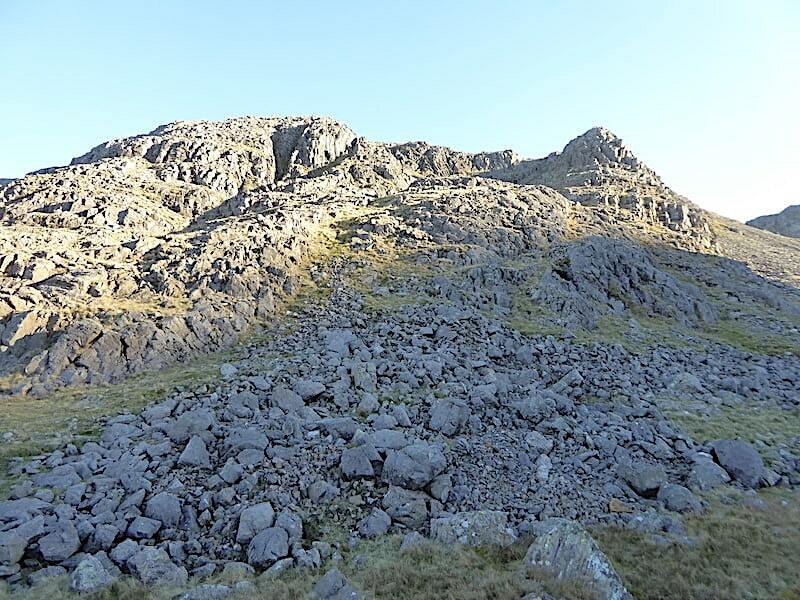 We could continue climbing and eventually reach the col between Great End and Ill Crag but it wasn’t much more than a half-hearted discussion and we decided to return using the same route as the outward leg. Not really what we like to do but I think that both of us have felt a little drained after recent events so our usual drive and energy just weren’t there in any great quantity today. So here we are making our way back down to the Corridor Route using a slightly different route from the one we took on the way up. 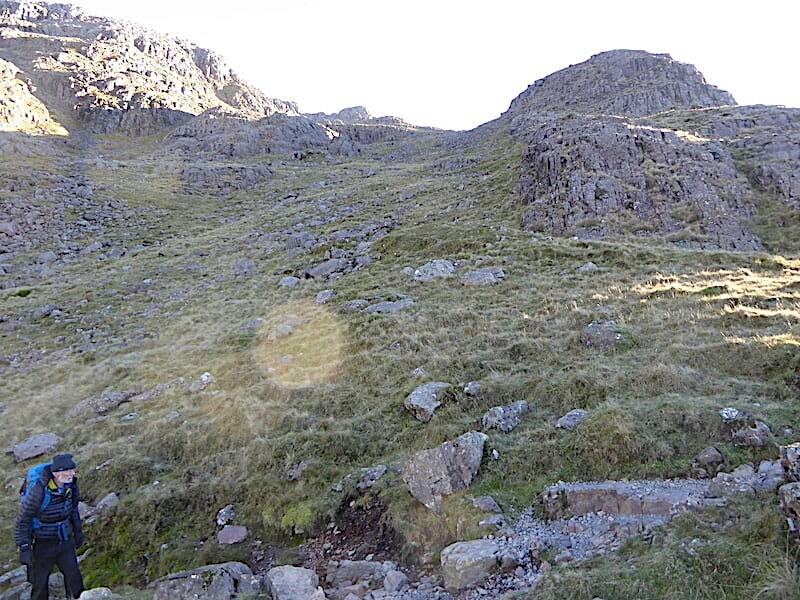 A look back up at our descent route as we reach the established route. The descent was just as steep, tussocky and uneven underfoot as the ascent was so it really makes no difference which way is chosen. 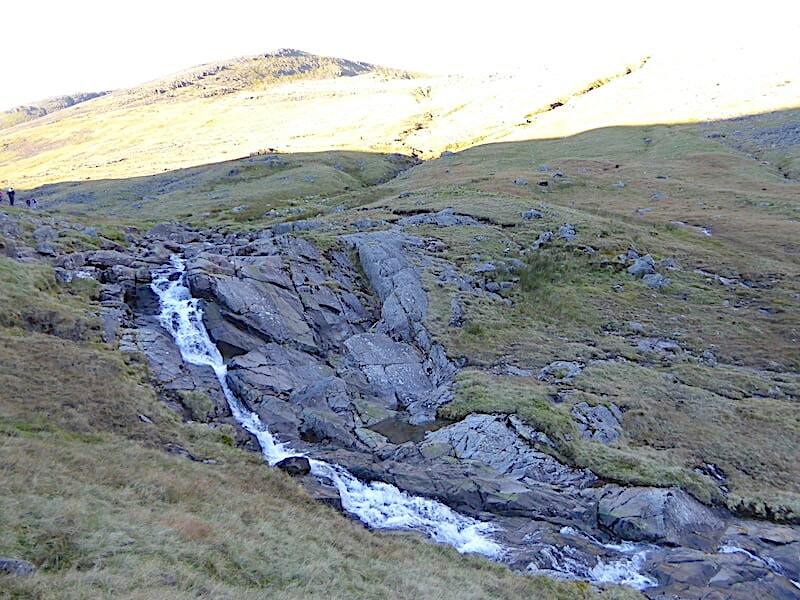 Back at the Skew Gill crossing once again …..
….. above which the crags of Spout Head are still getting plenty of sun. The crags and cliffs of Spout Head. They often seem to be ignored in many photographs in favour of neighbouring Great End, from which they are separated by the deep cleft of Skew Gill, so I thought I’d include a shot just of them. I thought they looked rather attractive in the afternoon sun. 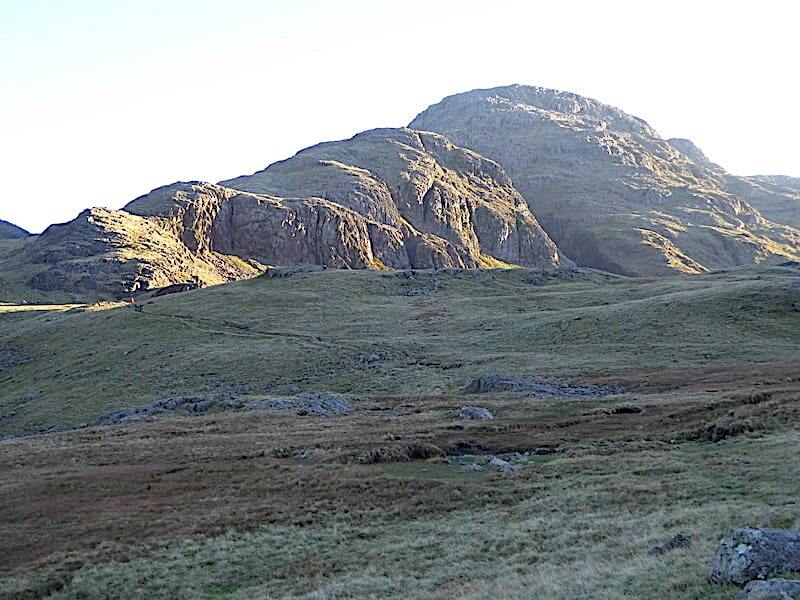 Making our way back to Sty Head with just this last short rise, a little boggy in places but not too bad overall, to walk up before we join up with the Esk Hause path once more and head left over to the stretcher box. 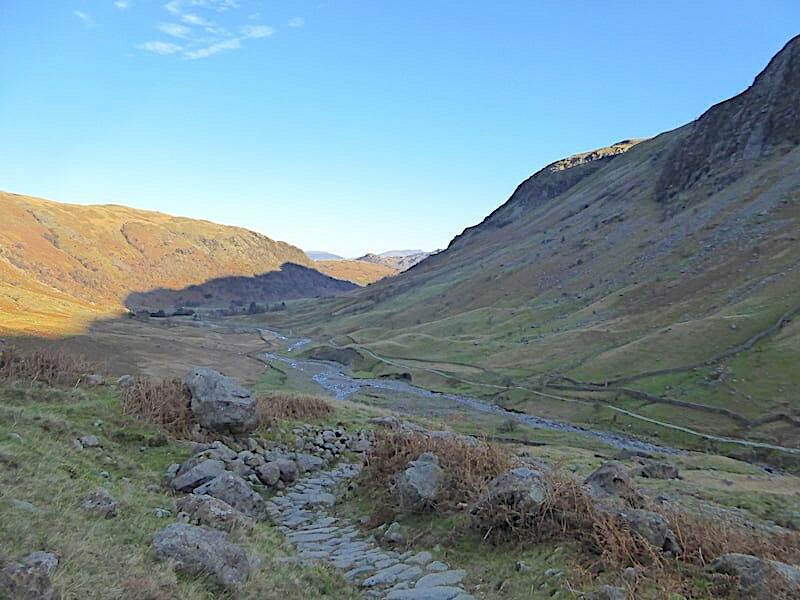 There was no-one at the stretcher box but there are a few walkers dotted here and there ahead of us on the path back to Seathwaite. 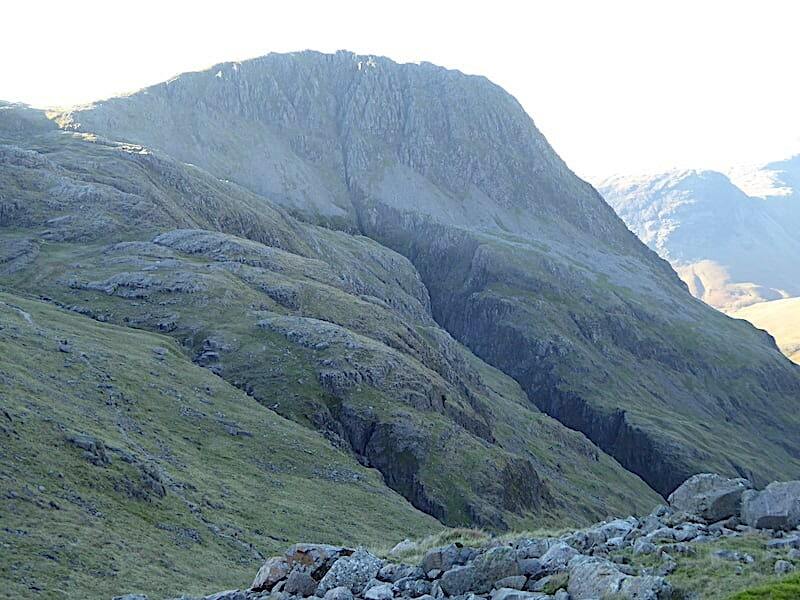 Great Gable is now blocking the sunlight so we’re back in the shadows again. 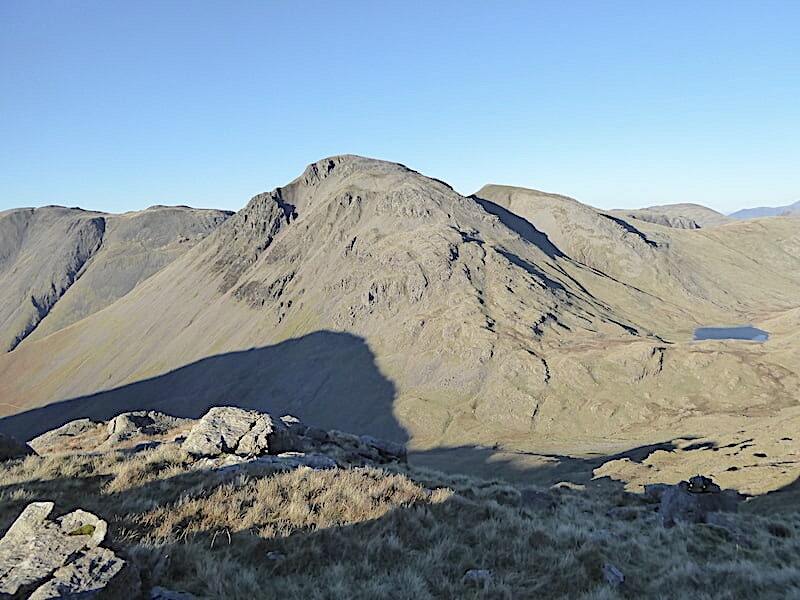 A look back at Spout Head and Great Gable looking very benign in the afternoon sun. 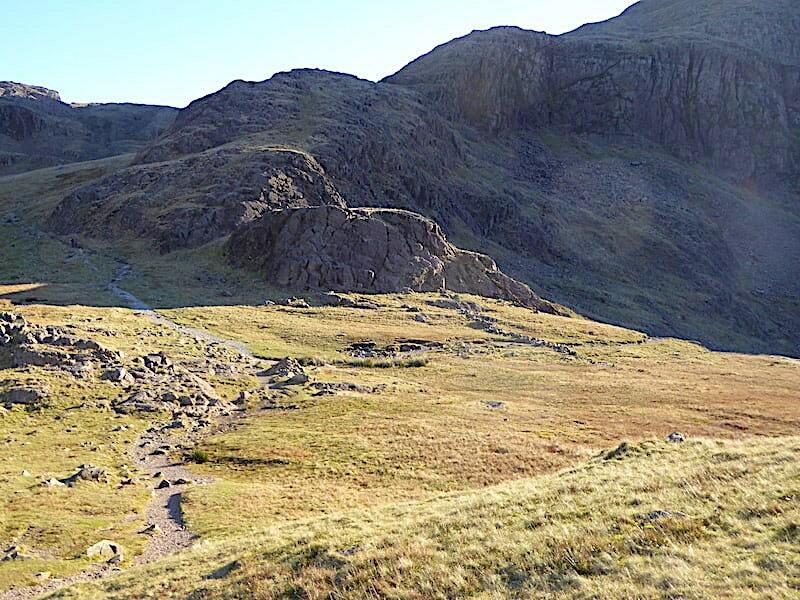 A couple of walkers in red jackets heading this way appear on the Esk Hause path below the crags and they are the only ones we can see behind us at the moment. 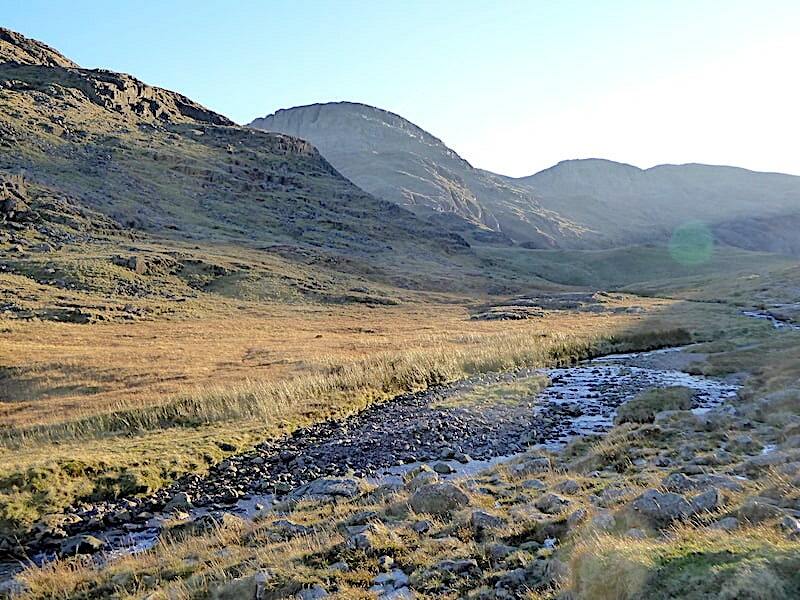 Further along Styhead Gill and another look back at the shadowy fells, the golden hues of the grasses and silvery sheen of the gill. 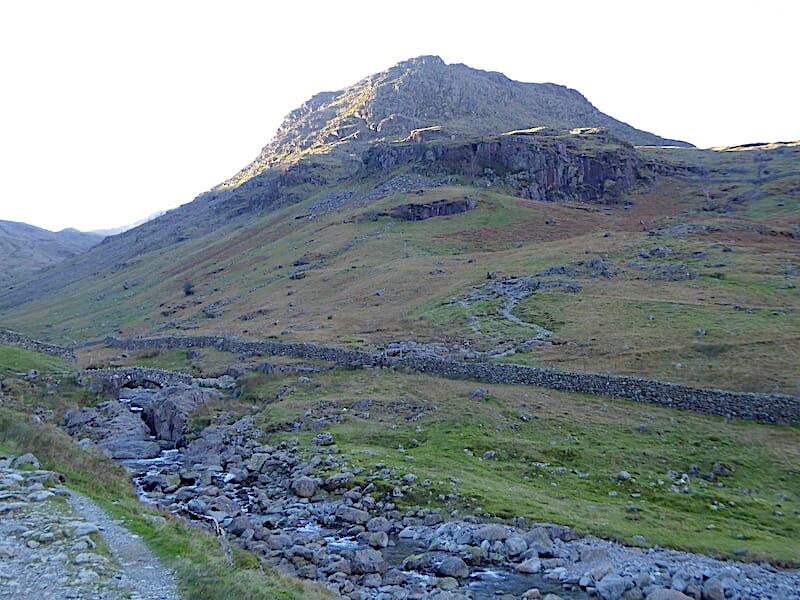 The gusty wind had dropped and the walk back to Seathwaite was warm and very pleasant. 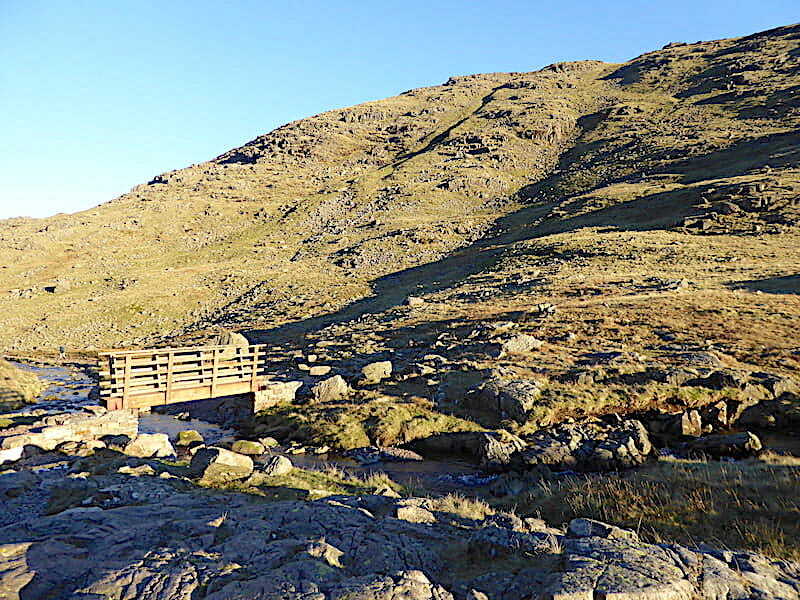 We crossed the footbridge over the gill …..
….. and followed the path alongside the gill. An easy walk back and a very enjoyable last leg of the walk. Back to Greenhow Knott where we finished off the fruit juice and gave the legs a five minute breather before making the descent down to Stockley Bridge. 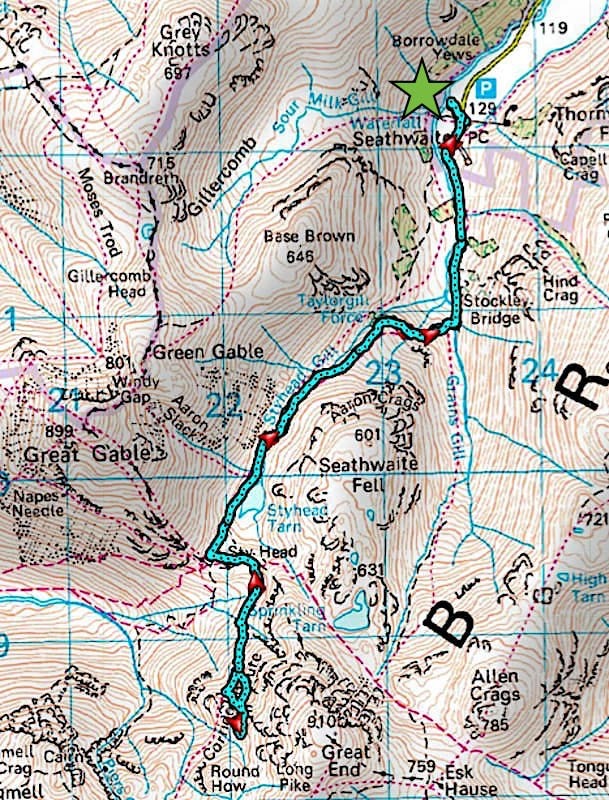 The two walkers in red jackets we spotted back at Sty Head passed by us as we were doing so. There is still plenty of sunlight around but none of it is landing on us now that the sun is behind Great and Green Gables so that’s the last of our sunshine ration gone for the day. I find it impossible to walk over the Stockley Bridge and not take a photo, even though I have dozens of them, so here I go again with a shot looking up Grains Gill as I cross over. The red jacketed walkers, a dad with his young son, who passed by us up at Greenhow Knott, had stopped for a break here and were rummaging in their pack for refreshments. The valley is now in total shade so we quicken our pace back along the mile or so down to the farm and the car. So that’s the end of today’s walk, not a very long one but after a month of not walking up any inclines whatsoever we both had weary legs by the time we were back at the car. As we drove back along the lane I was surprised to see quite a good number of cars still parked along it waiting for their owners to return. Its just on four o’clock, the sun has set and there’s about another thirty minutes worth of daylight before it gets dark. There was no-one coming down behind us so let’s hope all the missing car owners have torches tucked away in their packs.